The quality of our sleep each night has a huge effect on virtually every aspect of our lives, from work to relationships to mental health. Sleep is so important that we should really try our best to get the best sleep possible each night. A good place to start is upgrading your mattress – and if you’re not ready to spring for a brand new bed, a mattress topper can be a great choice. If you’re looking for the best mattress topper for side sleepers, this guide can help! Side sleeping is the most popular sleep position out there, so there are a lot of folks looking for good products for those who sleep on their sides. Generally speaking, side sleepers need thicker, softer toppers than those who sleep on their backs. That said, you don’t want something too soft, as you still want to be supported. This guide will help you find the best side sleeper mattress toppers for your needs and budget! There are many different options, but we have narrowed it down to just a few to help our readers find what they are looking for. The Sleep Innovations mattress topper is a perfect solution for those looking for a topper for side-sleepers. It’s unique because it actually has two distinct layers: 2″ of cooling gel memory foam, and 2″ of a quilted fiber fill. The foam is relatively firm, providing a nice base layer of support, while the fiber fill layer is quite soft and comforting. This product also has excellent cooling properties, thanks to the gel-infused memory foam. If you’re someone who sleeps hot, and/or lives in a hot climate, this is an important feature to look for. For those seeking a premium product at a very reasonable price, this may be the best mattress topper for side sleepers. It’s made in the USA, and comes with an industry-leading 10 year warranty! Click here to learn more! The Linenspa 2″ mattress topper is the best cheap mattress topper for side sleepers. It’s very affordable, yet still a very high-quality product. It’s made with 2″ of memory foam, which is infused with cooling gel to help with temperature regulation. This topper sleeps quite cool, even in hot climates. 2″ is on the thinner side for side sleepers. The upside is that this is cheaper, smaller and easier to move around than thicker toppers. The downside is that it may not accommodate your hips and shoulder as well as a thicker unit would – this is particularly true for heavier people. Despite the low price, this is a quality product. The manufacturer stands behind the LinenSpa with a 3-year warranty. Click here to learn more! The Ultimate Dreams Talalay Latex mattress topper is a premium topper from a reputable company. 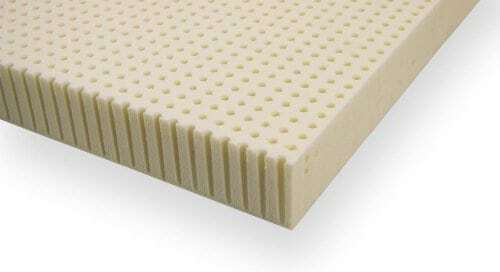 It’s made with natural Talalay latex, a luxurious and durable material that provides a great blend of comfort and support. This topper is available in Soft, Medium or Firm – we recommend Soft or Medium for most side sleepers. Latex toppers like this one provide a good blend of pressure relief and comfortable support. They are also naturally hypoallergenic. And while this product is more expensive than others on this list, the quality and durability make it well worth the price. If you look at mattress topper reviews, you’ll see that this product consistently earns high ratings from customers and experts alike. Click here to learn more! Experience – Our team is quite experienced in the sleep industry. From the latest sleep science studies to the greatest new products on the market, our team spends a lot of time learning about everything there is to know about sleep. Our boss is a Certified Sleep Science Coach, whose expert opinions and recommendations have been featured in NBC News, Forbes, Bustle and many more. Passion – We are passionate about helping our readers sleep better. Through product recommendations, how-to guides, and informational articles, we seek to inform others of the best ways to improve sleep quality. Research & Testing – We conduct extensive research into each product we recommend. This includes the product itself, as well as the materials used to make it and the reputation of the company behind it. We also hand-test hundreds of products to narrow our recommendations down to only the absolute best. Thickness – Most side sleepers will benefit from a thicker mattress topper, which allows adequate room for your shoulders and hips. The minimum thickness we would recommend is 2″, while most people will be more comfortable on a 3-4″ thick topper. Firmness – Most people who sleep on their side prefer a medium firmness mattress, somewhere between a 4 and 6 out of 10. So, we focused on this category of products to find the best solutions for readers. Quality & Craftsmanship – We focused on the quality of materials as well as the craftsmanship that went into each product. These two factors have the biggest impact on the durability and long-term performance of a mattress topper. Value – We always strive to recommend products with good value. That doesn’t necessarily mean the cheapest options – just the best options that are available at reasonable prices. Questions about the best mattress topper for side sleepers? Let us know in the comments and we’ll be happy to help! Looking for more options? Check out our complete guide to the best mattress toppers for every need! 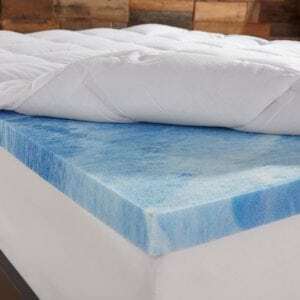 Mattress Pad vs Mattress Protector: What's the Difference?